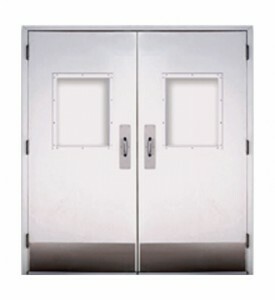 Paired Swinging Laminated Fiberglass Door System – Power | Dock Door Systems Inc. Designed with features essential to maintaining FDA and cGMP regulations, our LXP series fiberglass swing doors are priced to meet your demanding budget constraints. Stainless steel push/pull hardware. Frame mounted, three sided bulb type perimeter gasket, center astragal, and bottom sweep gasket.